The Hull Hospital recorded a 200 per cent occupancy rate Monday, making it one of the most overcrowded hospitals in Quebec, according to health website indexsante.ca. 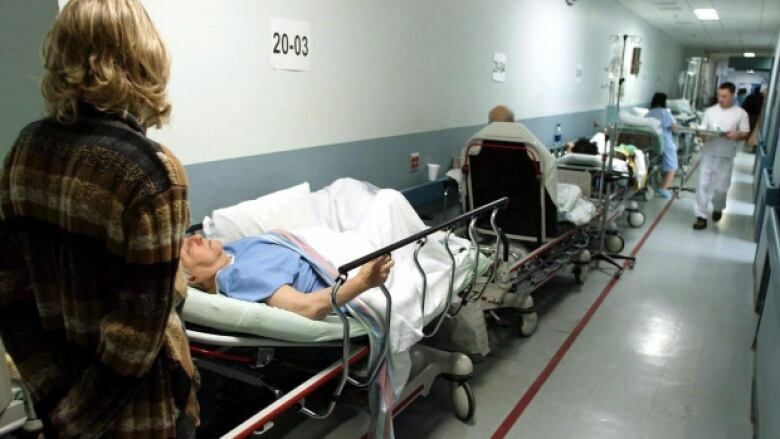 The Hull Hospital recorded a 200 per cent occupancy rate on Monday, making it one of the most overcrowded hospitals in Quebec, according to health website indexsante.ca. Twenty patients were left on stretchers for more than 24 hours, while 10 patients spent more than 48 hours on them. A total of 52 stretchers were used at the hospital. Meanwhile, emergency room overcrowding at the Gatineau Hospital left 41 patients on stretchers. Normally, that hospital has 28 functional stretchers, but on Monday their occupancy rate was 146 per cent. In comparison, the Suroît Hospital in Salaberry-de-Valleyfield had a occupancy rate of 245 per cent, the highest in province. "We always anticipate, [at] this time of year, for there to be a greater number of patients," said Roberto Bomba of the La Fédération interprofessionnelle de la santé du Québec, the union representing most Quebec nurses. Bomba said flu and accidents related to winter weather often keep hospital admissions high, but hospitals aren't responding to the yearly trend with appropriate resources. "[They] don't have any plans of action to address these certain needs in terms of the population of the province of Quebec ... which leads to an overcrowding ... [and] leads to a delay in terms of wait times." As a result, Bomba said, nurses are working longer hours, which is having a negative effect on their own health and wellbeing. "It's a vicious cycle. You're forcing people to work overtime. They're fatigued. They're putting their health at risk. It's also very demanding cognitively." Nancy Roy, who works in the emergency room at Gatineau Hospital, said the problem of overcrowding and long hours has now become a year-round issue. "[Nurses] feel as though they're being kept there as hostages to work and it's because the personnel is tired. We're out of breath and we're exhausted," she said. In January, Quebec Health Minister Gaétan Barrette announced the province was spending $23 million annually on extra beds to ease the demand on emergency rooms. Barrette said $5.7 million of this year's amount would be invested before March 31. The region's health authority has temporarily added eight beds at Hull Hospital and 12 at Gatineau Hospital in an effort to meet patient needs.